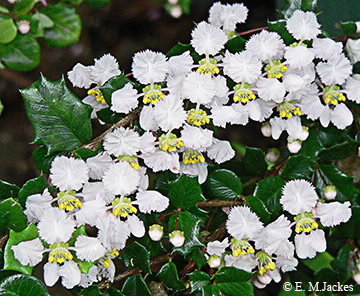 A spreading shrub to about 1 m tall originally from the West Indies, the alternate leaves have sinuate margins with spines at the apex of each lobe, thus resembling holly leaves. The flowers which, arise in the leaf axils, have 5 small clawed pink to lilac petals. Fruits are fleshy red drupes to 15 mm diameter.